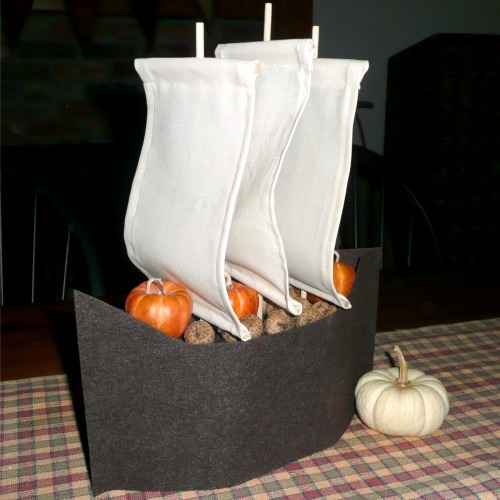 Have you guys been checking out some of the great Thanksgiving projects that have popped up all over the blogosphere over the past week or so? I decided to spend a little time this weekend creating some of the wonderful projects that other bloggers have to offer up. 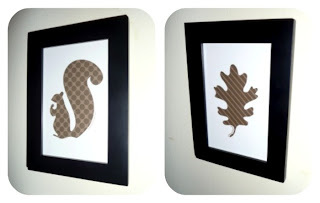 The squirrel and oak leaf silhouettes were free printables from Yellow Mums. She also has a beautiful turkey silhouette to match that is available in her Etsy shop. 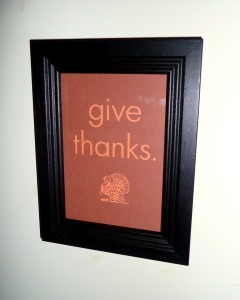 The "give thanks." print was a free printable from madigan made. I love the simplicity of it and the classic turkey added at the bottom. So now I have this beautiful wall, and all I had to come up with were some frames and some paper. 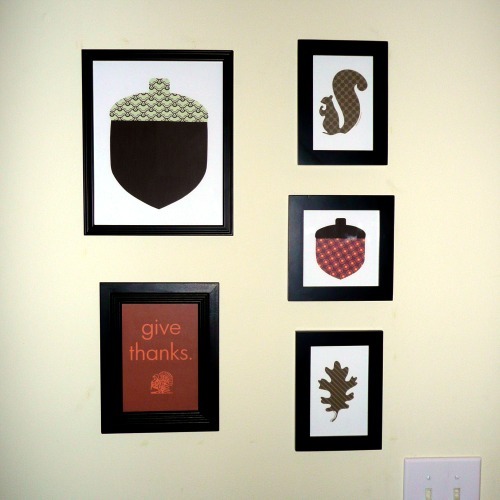 I plan to change out the printables with the seasons, so I can't wait to start hunting for some ideas for Christmas. I hope you check out some of the other blogs I mentioned today. I feel like, as a blogger, I'm always trying to come up with something original and new, so it was nice to stop and smell the roses for once... to take a look at what others were doing and use their great ideas. There are lots of them out there! Thanks for stopping by today! I told you that I was working on posting my holiday "to make" list. Well, I'm still working on it, but I hope to post it tomorrow or Wednesday in hopes that by sharing my list you might get some ideas for gifts to make this holiday season. Looks so welcoming!!! I love that Mayfair centerpiece and I bet the kids will too. 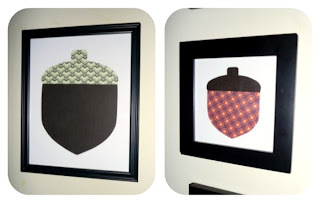 The stiffened felt is a really good idea and of course stuffed with acorn goodness. I think the centrepiece would also look nice on mantel too. I think your sails look better than Pottery Barn's and your pictures are fabulous. It all looks so great! I'm bookmarking this so I can use the other free printables as well. Thanks for sharing! What fun decorations! I love everyone's holiday cheer. I am lucky to have any decorations in my house, let alone seasonal decorations! Such cute fall decor! Thanks for sharing!!! Love the new prints! The acorns are especially cute!! I forgot to mention the centerpiece - so, so cool!! Great job Gwen (as usual)!! That's so cool! I might have to add this to my list of things to do. I love the paper you used for the art. So simple but makes such an impact! 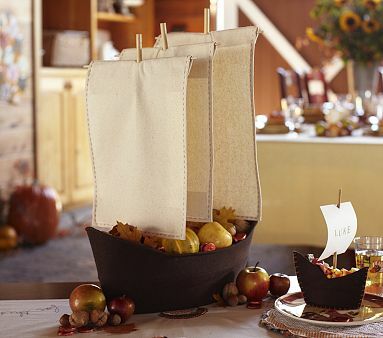 Love all your fall decor! My boys would love the centerpiece as well! :) Where did you get the turkey? Did you make her? Loved the framed pieces. It looks great! I love your fall decor! So simple. Great job on that amazing centerpiece!!! I love the ship. What a great idea? How do you put two photos side by side? Is it very hard? 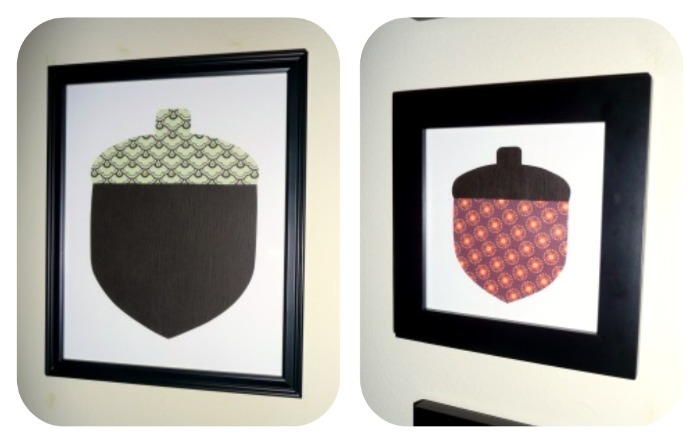 Love those framed pieces!! I just visited each of the blogs to get my own downloads (and told them I came over from yours :). Thanks for the fun ideas! I love how the centerpiece turned out-great job! That is awesome! I would love for you to come link up at my Strut Your Stuff Linky Party!